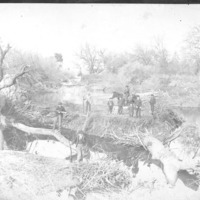 The Friant-Kern Canal was constructed along the east side if the San Joaquin Valley. 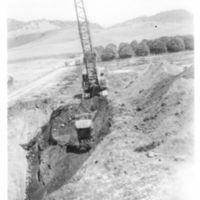 Here, equipment digs the canal through part of the Marioka farm in 1945 or 1946. 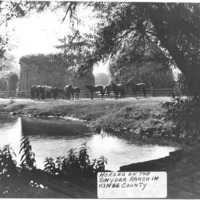 Horses near canal with fenced area with haystacks. 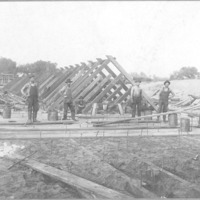 Construction workers at dam site. 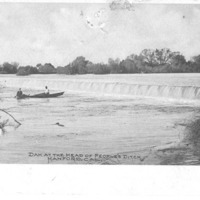 Two men in boat at base of long dam with water flowing over top. 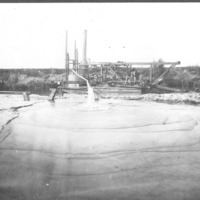 Dredge pumping water out of canal. Crew on dredge and another man on land. High bank in background. 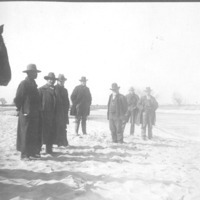 Children near washout of levee. Some boys have weapons. One on horseback. Location is above headgate of Last Chance Ditch. Two identifications on photo. 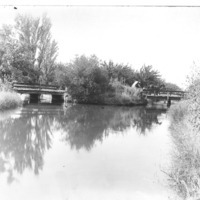 Horse and buggy crossing bridge over canals. Location may be near Laton. 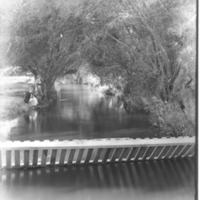 Two women on shaded bank of waterway with weir in foreground. Small ranch house next to dirt road and canal. 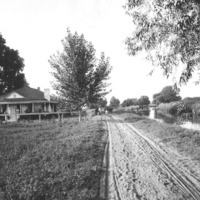 Three people on porch and two children with animal on road.